“Mike’s Off Road” Racin’ for Vets Fundraiser! 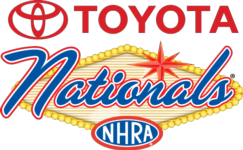 July 22, 2016: There was a drag race and raffle for the NHRA Las Vegas Motor Speedway national finals trip for two October 28-30, 2016. Raffle was sold and drawn during the Mikes Off-Road dirt drag race at the “Big Sky Country State Fair” — Bozeman, Montana Gallatin County Fairgrounds. Winning raffle ticket included 2 flights from any USA commercial airport, 4-nights in Las Vegas: The Golden Nugget. Race classes included new and old stock, sportsman, comp mod and X-class. 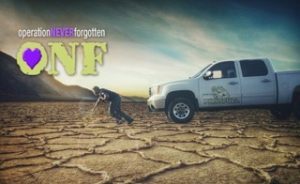 May 22, 2016: Veteran Michael McCastle pulled a 2.2 ton truck for 22 miles across Death Valley in the Mojave Desert–the hottest recorded desert in the world! Michael pulled the truck with a body harness one mile for every veteran life lost to suicide each day. Death Valley represents the mind of the afflicted; desolate, lonely and hopeless. The feat symbolizes hope for life. This helped bring veterans and caregivers to more ONF PTSD workshops! Singing Contest 2013: Freedom Sound Off is a patriotic singing contest fundraiser with live judges, audience and prizes. Singers competed in Billings, Bozeman and Three Forks, Montana. The Three Forks competition was held at the “Rockin’ the Rivers” rock concert. All ages and levels of singers were invited. Some of the prizes for the winners at the contests included recording sessions at professional studios, ski resort package, rock climbing lessons, mountain horseback riding, horse wagon ride BBQ with music, Yellowstone llama treks, dinners, massages, retail gift cards and more! The sound was professionally managed by SWEET T.E.A. Music. Grand Prize Nashville Trip! Every contestant was included in a drawing for a trip for two to Nashville that included airfare, two nights at the new luxurious OMNI HOTEL and dinner with LEE GREENWOOD. The winner also received backstage passes for one of Lee’s performances at the GRAND OLE OPRY. The Nashville Trip Winner, Jurnee Armstrong along with her brother and Lee Greenwood at the Grand Ole Opry. Both performers with Fiddle Dundee in Bozeman, MT. The first 2011 winter and 2012 summer outdoor Sports, Afield & Stream (S.A.S.) retreats at Big Sky Resort in Montana held a large public dinner and auction with ENTERTAINERS AND SPEAKERS. The banquet included free trip drawings for warrior guests and their families: Wilderness adventures, fly fishing trips, big game hunts, cattle ranch vacations, hot air ballooning and more. ONF’s former national spokesman of 7 years, LEE GREENWOOD, attended the first winter retreat. Celebrities sent private video messages to honor our warrior guests. Some of these personalities included J.R. Martinez, John Elway, Taylor Swift, Dennis Miller, Ted Nugent, R. Lee Ermey and others. A couple can be viewed publicly on YouTube: TOM BROKAW and RANDY COUTURE. Live and silent auctions each had autographed merchandise contributed by celebrities. Some of these contributors included Denzel Washington, NASCAR driver Danica Patrick, Larry the Cable Guy, Minnesota Twins Joe Mauer, Couture Xtreme UFC Fighters, Sarah Palin, Aaron Tippin, PGA Steve Stricker, Ted Nugent, John Elway, Taylor Swift, Montana Senators and more! October 2013: The first Michigan dinner started a tradition. ONF was given 50% of all meal costs and the wait staff donated all their tips. Former Veteran supporter, Miss Michigan STACEY MASON entertained everyone with her violin magic and vocal talent. The dinner was promoted in local newsletters, on the radio and social media. Local veterans organizations and local businesses joined the effort with attendance and auction contributions. Thousands of dollars were raise with virtually no expenses. Tuesday, February 17, 2015: The second Michigan dinner was at Ann Arbor’s “Frenchies” from 5-9 PM. 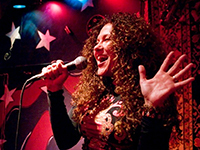 Stacey Mason performed again and joining her was musician/singer KELLY TRUDELL who has performed at Walter Reed and Rolling Thunder concerts in DC. The live auction items included: Red Wing Hockey tickets, Detroit Tiger tickets, autographed prints, patriotic handmade quilts and much more! This ONF warrior program fundraiser was sponsored by the nationally awarded Washtenaw County Chapter of Vietnam Veterans of America. April and May 2012: Buffalo Wild Wings, IHOP and Fuddruckers participated in this ONF fundraiser on specific Wednesdays at various restaurant locations throughout Montana and Michigan in 2012. 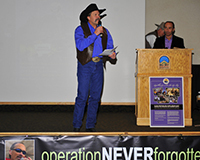 ONF’s former spokesman Lee Greenwood helped promote “Wounded Warrior Wednesday” on local radio stations. 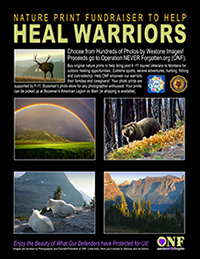 Up to 20% from all meals were donated to ONF’s Warrior Programs. ONF President Linda receiving a check from Buffalo Wild Wings in Billings, MT. 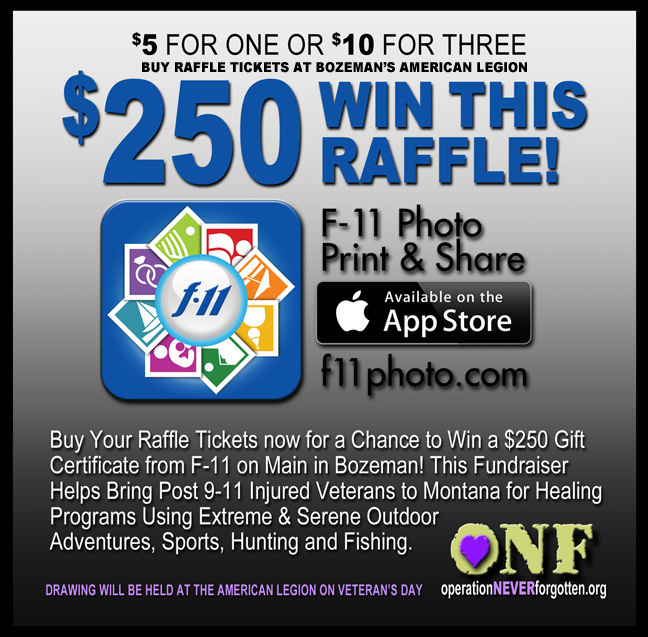 ONF raffles have varied from photography merchandise to Carnival Cruises and Vegas Vacations. 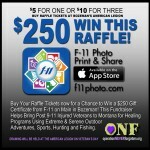 You can put on a raffle benefit for ONF warrior programs of any size, big or small. See the PUT ON A FUNDRAISER for ideas and the VOLUNTEER page to get started! 2013 – 2015: R.O.A.D. R.A.S.H. biker club out of Billings, Montana are veterans supporting veterans. They create and host poker events to raise money for ONF programs. They have been a great supporter! Be sure to thank them on their Facebook page. Biker clubs are welcome to put on their own poker runs. Artists Who Want To Make a Difference! Artists, photographers and craftsmen can donate any revenue amount, sold anywhere. ONF will help support artists with their promotions if proceeds are 50% or more. offers! See his work displayed at the Trillium Gallery. Sign up to volunteer, contribute or see PUT ON A FUNDRAISER! SLIDESHOW: Freedom Sound Off at Rockin the Rivers, Three Forks, MT; Nashville trip winner, Jurnee Armstrong at the Grand Ole Opry; S.A.S. warrior banquet with Lucas Hoge; Cattle ranch vacation winner Ken Wilson with wife Michelle. 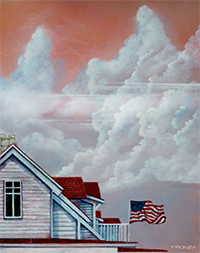 At Left: “Beach House” original painting by John Fronza. Images, videos and audios are created by and for ONF only and are neither for sale nor allowed to be copied without contacting ONF for terms and agreement.